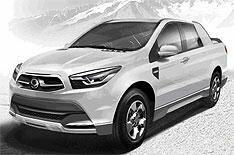 Ssangyong reveals concept pick-up | What Car? Ssangyong will show a concept version of its Actyon Sports pick-up at the Geneva motor show next month. It's called the SUT 1 and Ssangyong says the concept car has a more contemporary design than the current Actyon Sports model. The SUT 1 is powered by a 153bhp 2.0-litre diesel engine mated to either a six-speed manual or six-speed auto gearbox. Both two- and four-wheel-drive models will be available. A production version should go on sale early next year.